Stacy and I have been traveling together for many years, and each time I’m reminded why she’s my favorite travel partner-in-crime! We always seem to find fun, even when we are least expecting it. This past weekend we trekked up to Hilton, NY for our friend Alli’s daughter, Freya’s, 1st birthday and house warming party. 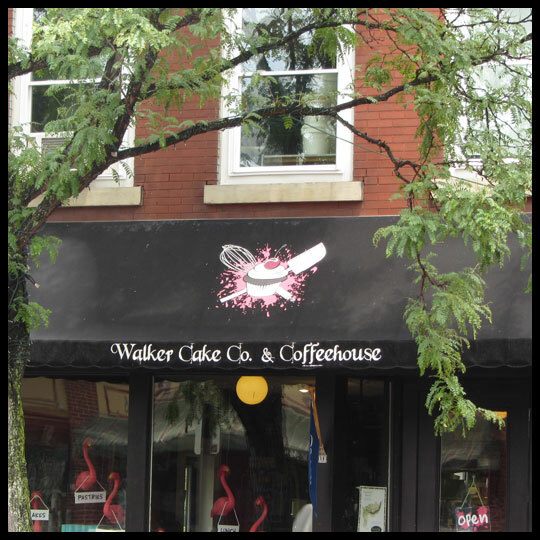 On our way there, we needed to stop for something to eat, and after randomly selecting an exit (Corning, NY to be exact) we ended up smack-dab in front of Walker Cake & Coffeehouse – with a cupcake on the awning! In Stacy’s own words: “The ganache was thick and set up like the frosting on a chocolate frosted doughnut from DD… So good! 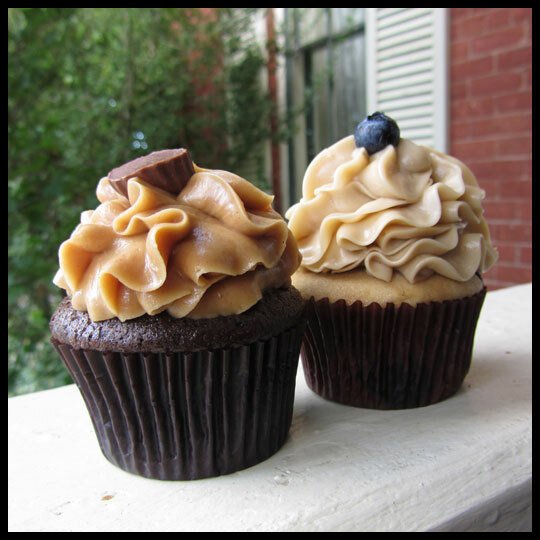 The peanut butter frosting was really thick, almost like the peanut butter you would find in a buckeye or Reese’s Peanut Butter Cup. I have mixed feelings on whether that’s appropriate for a frosting, but it was SO GOOD. The cake was dense and crumbly but moist. 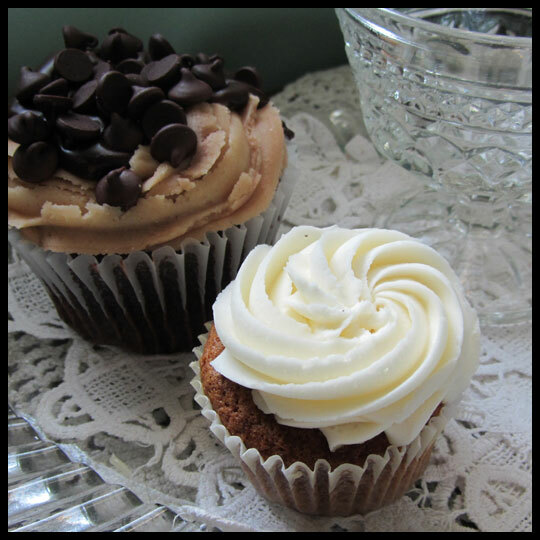 Unusual in flavor, this carrot cake might be the best carrot cake cupcake I’ve ever eaten. The frosting was not the usual cream cheese, but was a thick and subtly sweet buttercream, a perfect complement to the moist, spicy, and savory cake. This cake was not like any carrot cake I’ve ever had – there was something special about it – neither Stacy nor I could put our finger on what it was, but it really made this cake stand out and shine. I only wish I had gotten in the “mega” size, because this cupcake left me wanting more. Soon after, we arrived at Freya’s 1st birthday party and enjoyed watching her play, spending time with our friends, relaxing with a beer, and eating the delicious cupcakes that Alli made for the party. They were a chocolate stout beer cake with a cream cheese frosting. YUM! They tasted as good as they looked, in fact, I couldn’t resist eating just one. 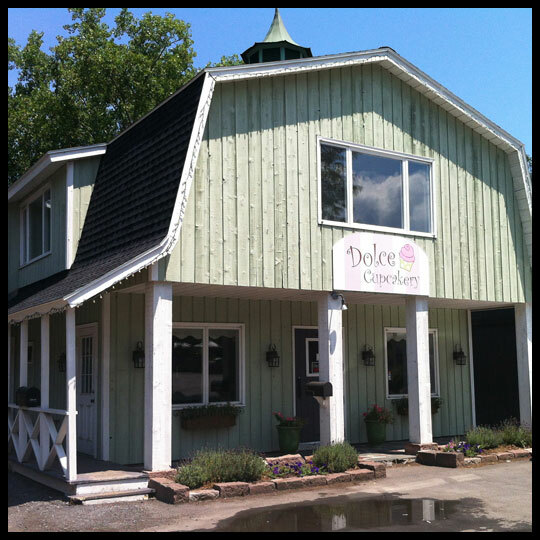 Stacy researched and found fantastic and fun things for us to do – so after eating a wonderful breakfast the next morning at our B&B, White Farm, we headed over to Avon, NY for a huge flea market. 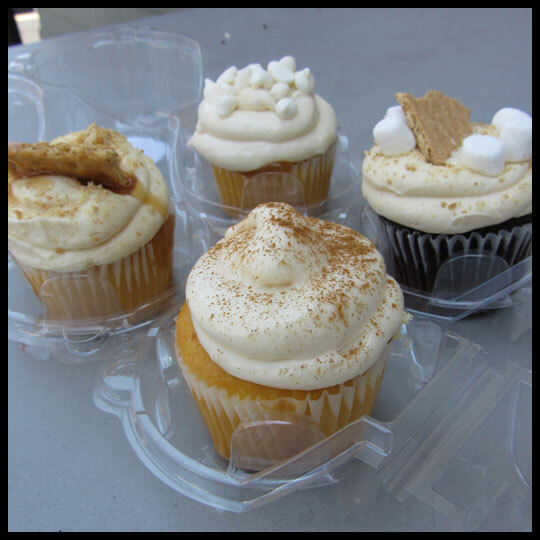 We found some fun items to purchase, walked around for a long while, and worked up an appetite for cupcakes. 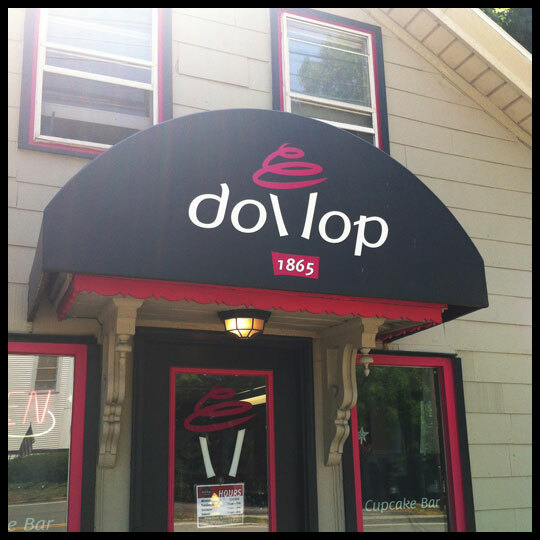 Our first cupcake stop of the day was in Penfield, NY called Dollop. They’ve won Cupcake Wars and had an interesting “build-your-own” spin on a cupcakery. After selecting our cake, frosting, filling, and toppings we were ready to order, and eat! So good! Loved the cream cheese frosting even if it was a bit runny. Vanilla cake was a great texture and the filling was perfect. This cupcake was just as good as the Peach Cobbler. The caramel drizzle was a great addition because the caramel frosting was very subtle. The star of this cupcake was really the filling though! Really worth the wait! The cake was moist and had great texture, the fluff filling was basically melted into the cake, but had great flavor, the icing was subtle in caramel flavor, and the graham cracker and marshmallow topping made this the perfect combination. Yummy vanilla cake with very flavorful apple pie filling, cream cheese frosting and cinnamon sprinkled on top = delicious. All of the components of this cupcake were shinning stars, I couldn’t pick my favorite part, I just want to order another one. 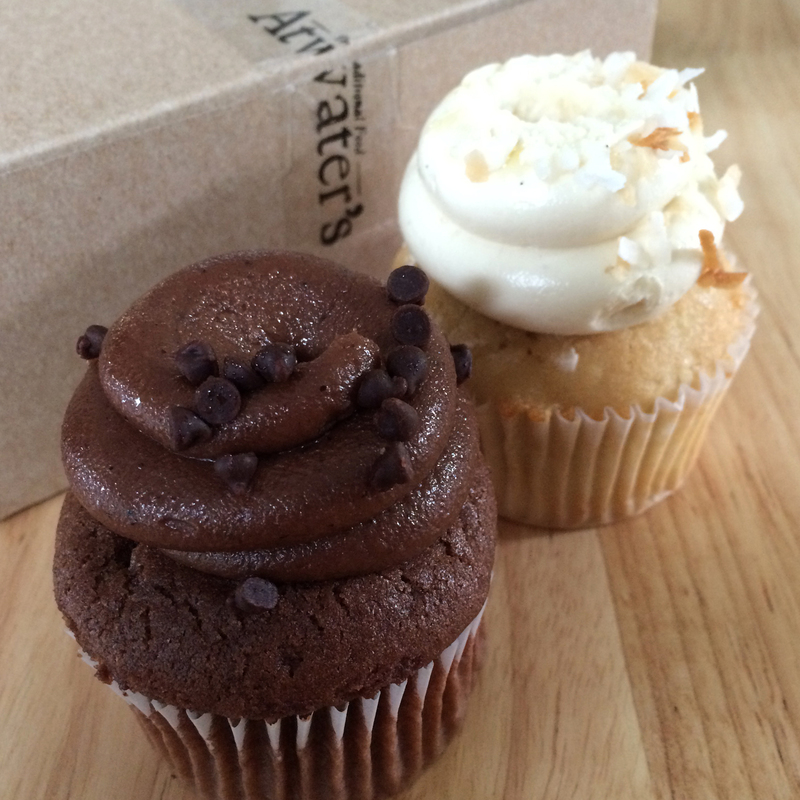 However, after tasting the cupcakes, neither of us minded spending almost $4 for each one. This cupcake was a slight disappointment as the frosting seemed to be made with a large amount of shortening, which we weren’t fans of. 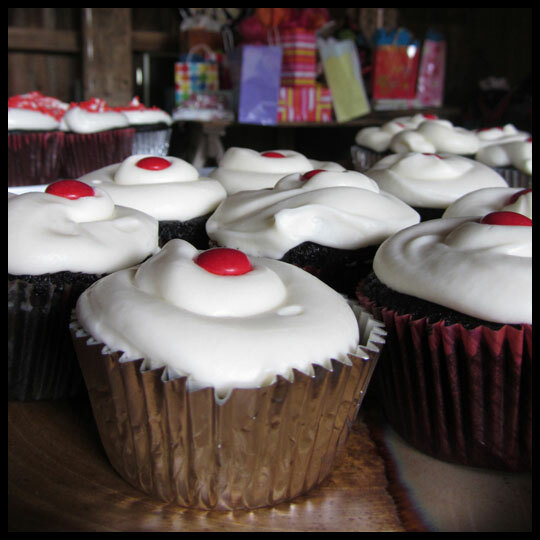 It made the frosting lack depth of flavor and left your mouth coated in a greasy film. The cake had really great flavor and seemed to be a blend of blueberry cake and brown sugar cake. While the flavor was good, it was very dense, more like a muffin. The cake was a bit heavy, but that is the only negative thing I have to say about this cupcake. The frosting was very flavorful, thick, and unlike the Blueberry Pancake cupcake didn’t seem to have any shortening in it, thank goodness. The cake had a peanut butter cup baked into it, which is always fun and adds another level of texture. Maybe it was the frosting that made me love this cupcake so much, maybe it was the chocolate flavor of the cake, either way, I scraped the plate clean. It was a fantastic weekend, full of friends, food, drinks, and cupcakes. Stacy and I are so lucky to be able to travel all around and spend time doing things we both love. I can’t wait to see what our next trip will be, and I wonder what we’ll randomly run into next time!